"Gokulashtami" or "Krishna Jayanti" or "Janmashtami" marks the celebration of the birth of Sri Krishna. Celebrations are held over two days. The first day is Krishnashtami or Gokulashtami. 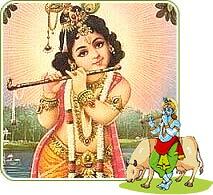 The second day is called Kalastami or more popularly Janmashtami. Lord Sri Krishna was born on Ashtami day or the eighth day after Raksha Bandhan during the Hindu month of SHRAVAN. As the story goes he was born in the dark half of the month and at the darkest hour of midnight. But the birth of Vishnu's incarnation was to bring joy and give security to the suffering humanity. He is considered to be one of Lord Vishnu's most glorious incarnations. He is popularly known as a naughty child, an inspired cowherd, a destroyer of demons, an enthralling flute-player, a divine lover, and a clever diplomat - all rolled in one. He is also considered to be the Hindu God of Music and is the patron god of Indian musicians . Krishna is always shown with his flute or "Bansuri". Sri Krishna is also known as Govinda, Gopala and Kanhaiya. Sri Krishna is Lord Vishnu's eighth avatar (incarnation) on earth. The main object of this incarnation of Vishnu as Krishna, was to destroy the cruel King Kansa of Mathura. Kansa, the king of Mathura was a very cruel tyrant. His tyranny spared no one, even the sages had to bear the brunt of this. Finally the Gods could tolerate no more and in a dream Kansa was told that his evil reign would be brought to an end by his sister Devaki's son who would kill him. The cowardly tyrant immediately threw his sister Devaki and her husband Vasudev in prison so that he could kill all the sons born to Devaki. In captivity Devaki bore six sons, each of whom were promptly killed by Kansa. When Devaki gave birth to her eighth child, the newly born baby changed himself into the form of Vishnu and commanded Vasudev to carry him to Nandgaon and place him besides Yasodha. That night the prison guards fell into a deep slumber and the doors were unlocked. Taking advantage of this opportunity, Vasudev slipped out of the prison and whisked away the God-child to the safety a neighboring kingdom which was ruled by king Nanda. King Nanda's domain lay across the Yamuna river. At that time the river Yamuna was high, but when Baby Krishna's feet touched the waters , the waters parted making a channel for Vasudev to pass. He was also asked to bring back the baby girl whom Yashoda had delivered. The generous king Nanda gave away his new born daughter to Vasudev knowing fully well what fate awaited her at Kansa's hands. Vasudev brought back the baby girl. Seeing the baby girl, the enraged King Kansa smashed her on the wall but she escaped his hands and flew away to heaven announcing -"Beware, your killer is alive". At Gokul, under king Nanda's protection, Krishna got the loving affection of King Nanda's Queen Yashoda whom Krishna looked upon as a mother. Days passed with fun and frolic, while the child-Krishna grew up. Krishna grew up happy in Nandgaon amongst cowherds. His flute-playing enthralled the young girls or "gopis" who danced around him. The cows gathered with his sweet flute playing. But one day rumors reached Kansa that Devaki's son had somehow escaped his clutches and was living in Gokul. You will notice that the theme of "Krishna with his Gopis" is a favorite among many Rajasthani paintings. Krishna was ideal in all his human relationships - a darling son to his parents, an endearing friend and comrade, a devoted disciple, a loving husband and a trusted brother. There are many stories that tell about his superhuman qualities and mystical achievements. In spite of this Sri Krishna never appeared distant to any of his fellow human beings, in fact he was dearer to them than their own nearest kith and kin. The shadow of his greatness never marred these bonds of the heart. To the Hindu, he is the supreme statesman, warrior, hero, philosopher, teacher and god himself. A major event in Krishna's later life was that he was the adviser to the Pandavas during the Great Mahabharat War between the Pandavas and Kauravas. He was Arjuna's charioteer. His teachings or preachings to Arjuna during this epic war is the "Bhagvad Gita" itself which means 'the song of the divine'. The Bhagvad Gita is written in the form of a spiritual dialogue between Lord Krishna and Arjun. It has 700 verses and captures the essential teachings of the "Upanishads". No other scriptural text propounds all the various paths to Divinity in such a profound and yet such a concise and easy manner for the commoner to understand and comprehend as the Bhagvad Gita. The setting of the Gita is also wonderfully unique - set in the Kurukshetra or battlefield representing the eternal battlefield of the human soul. The state of Gujarat is the abode of Lord Krishna. The town of Dwarka comes alive, with major celebrations and hordes of visitors. The temples of Vrindavan witness an extravagant and colorful celebration on this occasion. Celebrations are held on a grand scale in all Krishna temples all over India, especially the ones in Vrindavan, Mathura in the state of Uttar Pradesh and in Dwaraka in the state of Gujarat. Other regionally famous Krishna temples also celebrate Janmashtami with pomp and splendor. Celebrations are also held in many Hindu Temples here in the US. Like the Krishna Janmashtmi Celebration at Barsana Dham and Shree Raseshwari Radha Rani Temple in Texas. Many more Hindu Temples around the US celebrate this festival. On this auspicious day of Janmashtami the idol of infant Krishna is bathed at midnight and is placed in a cradle. It is then adorned with flowers, jewelry and a small "mukut" or crown. It is then placed in a cradle. Everyone swings the cradle to the tune of bhajan's or songs of praise. The atmosphere is filled with joy and exultation as everyone rejoices the birth of Vishnu's incarnation who has been born to give security to the suffering humanity. Then "Naivedya" is offered to god and then distributed to all. This Naivedya or prasaad is a of a mixture of puffed rice, milk, curds and sugar. In addition, plenty of milk products especially butter, which was Sri Krishna's favorite childhood food, are given as offerings. A wide variety of fruits are also offered to god. Plenty of Indian sweets are made during this festival. Among these are Laddus, Payasam or Kheer, Shrikhand and so on. Exactly at midnight, Krishna's birth is announced with ringing of bells and blowing of conch shells. Many women observe fast for the whole day and partake food only after Krishna's birth. In temples "Bhajans" - recitation of devotional songs and "Kirtans" - religious discourses - start early in the evening and continue till midnight - the hour of the Lord's birth. Singing and music continue throughout the night. The following morning "NAND-MAHOTSAV" is celebrated in praise and gratitude to Nand, the ruler of the cowherds of Nandgaon where Krishna grew up and lived in his childhood. In the houses, mango leaves are tied to the doorways to mark the auspicious occasion. Colorful "Rangolis " are drawn on the front yard. Inside the house, a small wooden mandap is erected and decorated with flowers and plantain leaves. An idol of a crawling baby Krishna is placed in a silver cradle which is then placed in the mandap. Lord Krishna's idol is decorated with flowers and a crown and jewelry at times. Most families keep a "vrat" or fast on this day. The fast is done all day and then one meal is had during the day. This is known as phalar, and consists of fruit, mithai, curd, (kuttu) Singhare-ki-Puri. This phalar is taken in the afternoon (around 2-3 p.m.) along with tea and coffee. During this fast, consumption of tea and coffee is not forbidden and can be taken at any time of the day. In the evening, the family members gather together and sit down in the decorated room and sing " bhajans" or devotional songs in praise of Lord Krishna, like "Om Jai Jagdish Hare." The birth of Krishna is welcomed at midnight by the gentleman or the lady of the house by applying the teeka and then doing puja to Lord Krishna. Prasad and "charnamrit" are then distributed to all present. This most popular ceremony of Dahi-handi takes place on the second day of celebrations. 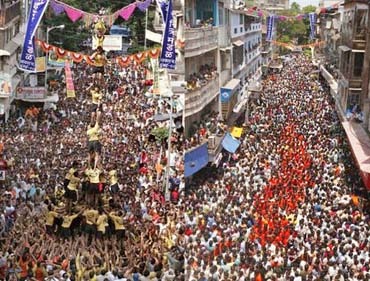 The celebration of Krishna's birth is also known as "Dahihandi". An earthen pot or "matka" or "handi" filled with curds, milk, curds, butter, honey, fruits and "jvari" is tied from a high rope about 20 to 40 feet high. The rope also has prize money tied to it. This prize money is distributed among those who participate in the building the pyramid. It is a spectacular sight to see. Young men form a human pyramid to break the pot. To do so they climb, constructing a human pyramid by standing over each other's shoulders till the pyramid is tall enough to enable the person at the top to reach the pot and claim the contents after breaking it. A popular image of Krishna was and still is......Krishna stealing dahi or butter from an earthen pot. During his childhood, the naughty and adventurous Lord Krishna along with his mates used to raid the houses of his neighbors in search of milk and butter, they too would build a human pyramid and plunder the pots of milk and butter. This ceremony replicates Krishna's love for milk and butter. Once the pot is broken, the contents are eaten as "prasad" amidst acclamations of "Govind" which is another name for Krishna. As Krishna loved song and dance, one of the main celebrations during this festival is "RASLILA". According to the Bhagwat Purana, Shri Krishna along with the gopis had danced the Raas on the banks of the Yamuna at Vrindavan. When the gopis felt conceited about Lord Krishna dancing with them, he disappeared from their midst. In the agony of separation from their beloved Krishna, the gopis recalled and enacted his lilas or divine episodes of his life - which in course of time came to be known as the Raaslilas. No other God in the Hindu pantheon, or for that matter in any other religion, is associated with so many romantic tales and so fully radiating with all the divine attributes as Sri Krishna. The Dandiya or Garba dances of today originated from that "Raslila in Vrajbhoomi" on banks of river Yamuna. Soak Beaten Rice for 10 -15 minutes. Roughly chop the cucumber and finely chop the green chillies and ginger. Melt ghee in a small pan, add jeera, green chillies and ginger. Pour over the Beaten Rice and add in the remaining ingredients. Mix well. Mix all the ingredients thoroughly. Knead the dough and make small pooris with hand or a rolling pin. Add less quantity of water as compared to what used while kneading wheat flour. Add cooking oil in a pan and fry pooris till dark brown and crisp. Serve it with curd and pickle. 1 tbsp cashewss, dry roasted. Pour milk in a pan and add rice to it. Boil rice and milk in the pan on medium flame until completely cooked (appx. 25-30 minutes). Add custard powder to milk and stir continuously. Add condensed milk, sugar and stir till sugar gets completely dissolved and the mixture thickens. Add nuts and raisin. Sprinkle it with powdered cardamom for extra flavor. Copyright © CuisineCuisine.com All rights reserved.